After 27 years of disputes, a monumental agreement on renaming Macedonia was settled with Greece in June this year. However, this doesn't mean that the southern European country will be able to complete its quest for identity. The 2014 project on urban planning and architecture in Skopje was implemented to modernise the capital. But instead, the project ruined the cityscape by mixing styles, statues and stories. We met with two brother architects who are trying to repair the damage. By the end of June 2016, temperatures peaked above 40 degrees in Skopje, even standing in the sun for a few minutes was unbearable. Still, many workers worked tirelessly on the city centre renovation projects, which were a titanic part of the Skopje 2014 project. The city transformed and took on a puzzling look. Under the heat of the burning sun, the new buildings of marble and gold shone bright like a thousand fireflies. In that moment, nobody imagined the turn that Macedonia would take. The construction stopped and the newly-erected buildings would soon become the subject of a heated debate. Dejan and Milan, two brothers from the city, watched the multiple renovations of the Skopje 2014 project with dismay. The eldest brother, Dejan, now works in an urban planning and architecture agency. Milan, the youngest, now lives in Ljubljana and has continued his architectural studies. Together, they work to involve citizens in urban planning projects and to bring awareness on Skopje's architectural issues across borders. We first met Dejan at the European Lab forum in Lyon where he held a conference on the current political and architectural situation in his country. We took the opportunity to ask him questions and, thanks to this exchange, Dejan welcomed us in his home town to asses what was happening. At the end of June 2016, we had an appointment at the school of architecture in Skopje to visit the city. Unlike us, Dejan was used to the scorching heat. He wore a light shirt with shorts and carried a water bottle in his hand while strategically hugging the walls. While classical music filled the streets of the city centre, we gradually became aware of the excessiveness and total anachronism of the project. Every bridge, every square is lined with intricate sculptures. Dejan admitted he wasn't familiar with most of the bronze cast characters... "When it all started out, it was as if they wanted to celebrate their past or something. Over one hundred sculptures have been built over the past five years. Nobody knows what some of the characters represent." While the new Parliament seemed to come straight out of antiquity, the concrete bridges were gilded in gold and the facade of buildings had been embellished with decorations that looked like colonnades and other neoclassical gems. What's more, the recommendations given by Japanese architect Kenzo Tange following the earthquake of 1963 (which caused 1,000 deaths, 3,000 injuries and more than 120,000 to become homeless, e.d.) were completely ignored. The institutional buildings built along the Vardar River, a flood-prone area in the city, bear witness to this ignored recommendation of a necessary minimum distance between the buildings and river banks. On the other side of the bank a pirate ship, which is in fact a friendly bar and restaurant, sits on a thick concrete slab immersed in the water. Add red double-decker buses similar to those found in London that run through the city to the mix, and the city's incoherence becomes clear as day. We get the impression that these ideas and styles were taken from all over and copy-pasted into the Macedonian capital. What was the theme of the evening? "Ancient Greece and English pirates"? Kenzo Tange had a global vision of the city in mind, based on functions and needs. Formerly socialist, Skopje had to own a number of public buildings, which would have made it possible to redevelop things without colliding with private plots. These needs have been relegated to the background, only to make place for an incoherent patchwork. The city seems to be looking for a cultural identity, as if it were trying to create a type of grandeur or an architectural heritage, which it currently doesn't possess. According to Dejan, "the whole procedure is illegal [...] In the end, no one knows the architects who have developed the urban plan over the last seven years. Nobody knows the change procedure, the urban plan, which was created maybe at 5am, when nobody was working." 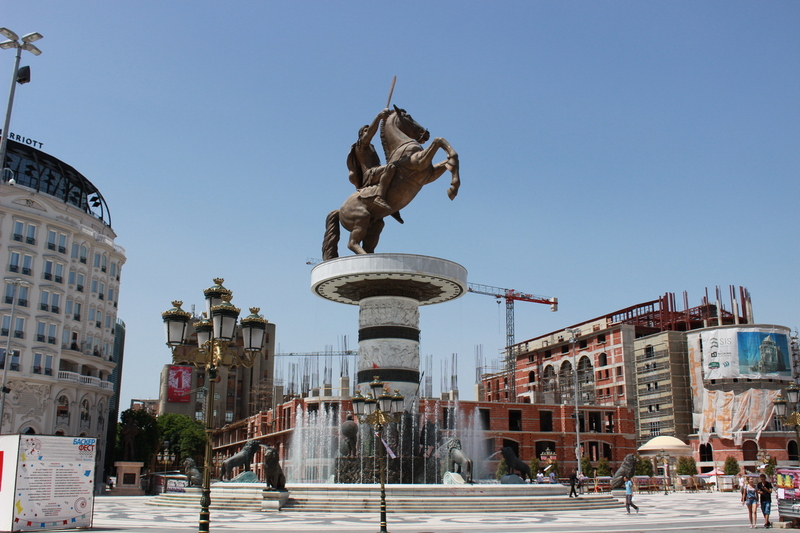 "Led by the conservative party for 10 years, the Skopje 2014 project was the result of an authoritarian policy to highlight the nation's greatness." The countless facades and bridges adorned with gilding, columns or sculptures make it seem as though Skopje has disguised itself. Since 2006, the Macedonian capital has tried to mirror a similar style and shape of ancient Greece in order to be able to recreate the same essence. The former conservative right-wing government (VMRO-DPMNE, Internal Macedonian Revolutionary Organisation - Democratic Party for Macedonian National Unity) did not hesitate to overstate the point. Alexander the Great, a well-known historic figure, is now commemorated with an airport in Skopje and a large statue in the city centre. Around 7 million euros have been invested to build this bronze statue, which will be placed at the top of a water fountain with a luminous and aquatic animation below. As for the airport, negotiations and the help from the new Prime Minister Zoran Zaev made it possible for its name to be changed to "Skopje International Airport". That's not to mention the latest controversy. Since 1991, the country had been called the "Former Yugoslav Republic of Macedonia" (FRYOM), but the Greeks were not happy with the name given that their country has a region in the north already called Macedonia. It was due to this debate that led Greece to block their neighbour's entry into the EU and NATO. Latest news suggest that the Greek and Macedonian prime ministers Alexis Tsipras and Zoran Zaev have finally agreed on the name: Republic of Northern Macedonia. After 27 years of quarrels, the agreement has become a historic moment. To "restore the image" of the city centre, the government had spent millions. Yet citizens seemed to have more urgent needs, starting with a better health care system. "In the end, about 600 million euros were invested in the city of Skopje, which represents only a tiny part of the huge country. Did we really need that at the time?" Dejan points out. Corruption cases related to the project were the cherry on top of the cake, provoking a strong reaction and anger from the general public. In early 2016, in addition to being corrupt, the VRMO-DPMNE government was suspected of monitoring thousands of citizens. In April, thousands of citizens revolted and took to the streets of the capital, throwing paint all around and targeting the buildings that act as a symbol of Macedonia's power and decadence. 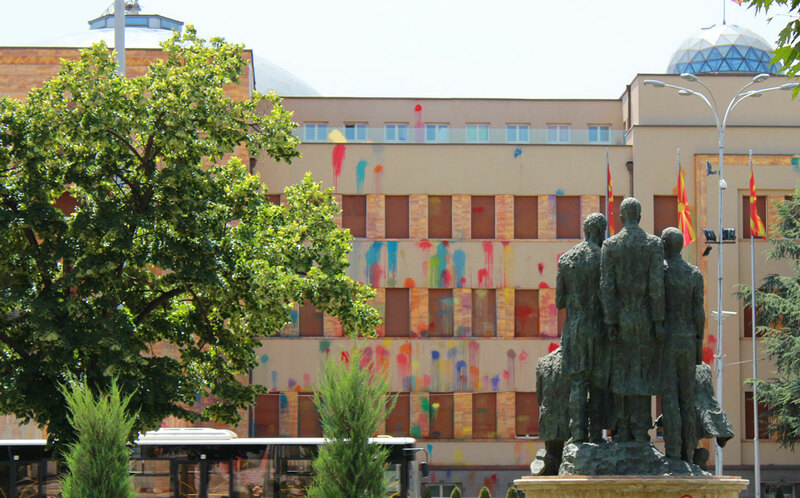 During our visit, we noticed many traces of this "colourful revolution" that decorated the city, particularly symbolic buildings such as the Macedonian Parliament. We make a detour to Ljubljana where we find the youngest of the two brothers: Milan. Expatriated to the Slovenian capital to pursue architectural studies, he tells us how he perceives his own home town: "The Skopje 2014 project is the result of an authoritarian policy, which was led by the conservative party for 10 years to show the grandeur of the nation, [...] but in the end, it became a poor quality renovation of the city centre of Skopje," Milan explains, who, despite the distance, could not imagine watching the protest movement in silence without doing anything. His older brother Dejan and some of family members still live there. But it is also his profession as an architect that ties him to Skopje: "Skopje is still a source of inspiration for me." Protestors may have armed themselves with paint, but Milan uses architecture as a means of action. He founded the association City Creative Network with a friend, Damjan Kokalevski, who he met at the University of Skopje. Located in the Macedonian capital, City Creative Network was created as a collaborative platform to research alternative methods of education, involve citizens in the thought-process behind public spaces and allow for young and creative professionals to exchange their expertise. "As an organisation, we came from the independent cultural sector. The authorities come from another sector and the citizens from yet another. So we place ourselves as a mediator between institutions, citizens etc." In order to carry out the project in an ambitious way, Milan reached out to his brother who had stayed behind in Skopje in 2015. They imagined an open stage a few dozen metres from the glamour of Skopje 2014, along Vardar river. They created the "Nautilius" project, which provides a direct pedestrian connection from the street to the waterfront, allowing for new spaces to emerge to host cultural events. The structure stands as a beacon of free artistic expression and independent cultures, which encourages citizen engagement. It was built by a group of Viennese and Macedonian students, architects, citizens, craftsmen and artists over a three week period in July 2015 in Skopje. According to Milan, "for the first time in Skopje, it was an opportunity to reflect on the use of public space." The opposite point of view is also true. Perhaps even a little too much for the city. The artistic activity, which was supposed to be carried out by the cultural centre for young people, unfortunately dried up. To the point of leaving an abandoned structure, which was quickly vandalised, but above all misunderstood by residents and passers-by. The curtains that served as shade were torn to shreds, the wooden steps broken down to splinters, with only a steel skeleton staying put. As for the defenders of the project, a question arises: how to spontaneously appropriate a scheme when one is not accustomed to invest in public spaces? Nonetheless, Nautilius still managed to call into question the Skopje 2014 project and, more broadly, the policy that was strongly pursued by the government and the municipality. In the architectural world, the project also received a rather prominent reception, and has been featured in several blogs and specialised magazines in Europe. However, the structure that is still visible today is just an abandoned site. Measuring the impact of a project like this based on the awareness and understanding of Skopje's inhabitants of public spaces is still as difficult as ever. What is interesting, however, is how the two architect brothers participated and used their own weapons to protest the nationalist VMRO-DPMNE party and its authoritarian methods. In 2018, the country emerged from more than 10 years of conservative governance. For the city of Skopje, the revival looks more like a hangover. The new social democratic government has since attacked many projects. Skopje 2014 already seems gargantuan. "What do we do with all the damage? As far as I know, the Arc de Triomphe (Porta Macedonia) and the Memorial House of Mother Teresa are going to be demolished," says Dejan. The government has effectively ended the Skopje 2014 project and announced the destruction of some monuments and statues, yet there are still many problems that remain. Many issues are intertwined and confront each other, both in the symbolic and political dimensions. There is also the issue of dysfunctions with regards to urban space, especially concerning larger economic issues and the cost of such a project. The total estimate of "renovation" today stands at more than 680 million euros, an amount worth so much in an economy that remains extremely fragile. A commission appointed by the new government is in charge of assessing the damage that the Skopje 2014 project has had on the city, and will have the difficult task of proposing solutions for the future of these impractical buildings. The city must escape from this fantasy past to perhaps one day become an exemplary city. Maybe the way Kenzo Tange first imagined it... who knows? One thing is certain: it is time for Skopje to remove its costume.